I’m working on a new all-metal press design…. a small (5x8) sign-press style machine with grippers, and possibly a throw-out / trip so that it doesn’t print on the backstroke. The idea is something similar to the Showcard 7x11, or my wooden Small Experimental Press, but more refined. ( http://www.briarpress.org/41110 ). Some parts are already built, others are still on the drawing board. The bed is already built, as are the grippers and base. Now I’m working on the carriage, and have a few questions for folks familiar with NOLAN proof presses. 1- Are the main roller bearings in the roller itself? or does the roller shaft turn in bearings on the frame? What I’m wondering is does the roller axle also serve as a structural crosspiece? 2- Are the idler trucks mounted on eccentric studs so they can be adjusted? I’m assuming that they are, just like on my Showcard press. The machine I’m working on is beyond the skills of the average small workshop since it requires a complete set of machine tools, so publishing the plans is not practical. BUT I’m wondering if ( and that is a big “IF”) the machine can be built for a reasonable price, would anyone actually be interested in buying a copy? Alternately, would anyone be interested in the machine in kit form, with all the machine work done, for assembly with simple tools? On that last question, I’m open to any reasonable input… yea, nay or whatever. It has been 50+ years since I have worked on a Nolan, so I can’t help you there, but I have a few observations on the project in general. I think the idea of a small cylinder press is a good one, mainly because the impression is made a little at a time, in the nip between the cylinder and the form. This of course allows the necessary impression pressure for almost any degree of ink coverage in the design, which is hard on a platen press. Whereas one is limited to 1/4 to 1/3 total ink coverage on a platen press, almost complete ink coverage can be achieved on a cylinder press. Instead of reproducing a showcard press, though, I would reproduce a miniature simplified Vandercook type press. In other words, I would use 1) a feed table like a Vandercook has, which could be plywood, 2) a bigger cylinder than a showcard press, with simple spring loaded grippers which you could push the paper under, or maybe with some sort of “simple” manual way to raise the grippers. The cylinder could be made to take packing or maybe a sheet of very thin rubber, which would eliminate the cost of having rubber vulcanized on the cylinder directly, 2) a gear on the end of the cylinder which engages a rack on the side of the bed [these are “off the shelf” items], 3) a crank on the end of the cylinder (probably also off the shelf, 4) no inking system. I would make the cylinder size so that one rotation made the print, not like a showcard press where more than one rotation is necessary. If you made it for a 6 X 9 sheet size, for instance, the cylinder circumference would be 9 plus maybe 1 1/2 inches for the packing clamps and grippers, so 10 1/2 inches circumference, which would be 3.34” diameter. You probably could make the cylinder out of iron plumbing pipe (maybe schedule 80 or extra heavy pipe). You might have to choose a cylinder size which corresponded to a pipe size. You would have to take a slight cut on the pipe to true it up. You would have to make the metal plugs for the cylinder ends. 1 It seems to have bearings in the roller. I cannot see them, but they are definitely not in the frame. 2 Mine does not have eccentric studs. I work with students all of the time and I know there would be interest from them, it just depends on what your price point would be. They are great utilitarian starter presses. Someone was makining and selling one that was aluminum and doubled as a backpack a few years ago. I find it encouraging that someone is interested in bringing a new press to market. and had the parts drawings if not the actual plans. He said he could not bring it to markets at a price customers would be willing to pay, and be able to make a profit. I will work and teach students at no cost, but I will not build a press to sell for cost or less. Good luck in your efforts and you may end up with one off for your own pleasure. I would be interested in buying one of these, especially in kit form. There would probably even be some market for an unmachined kit version as well. I can’t be the only letterpress enthusiast with a bench lathe and minimill. Geoffrey- your idea is certainly worth a lot. I agree with you wholeheartedly about the cylinder press being superior for a small machine. I also like the idea of a mini-Vandercook and your concept about which features you’d include. You think a lot like I do…. which may or may not be a good thing! ;) I may have to do some sketches tonight, and work it out in my brain. Steve- thanks for the info on the Nolan. That’s what I was thinking about the roller axle. I’m guessing there is a shoulder machined onto the axle, which fits tightly against the inner side of the side plate, and then a nut on the end. But without an eccentric stud how does one adjust the press for wear? I agree about price-point being very important, which is why I’m leaning toward simplicity. The Backpack Press was made by Craft & Concept, but I don’t think it was ever produced beyond a few units. I looked at their design carefully, and think they may have some flaws in the way the rails attach to the bed….. but I’ve not seen one in person. Inky- Fritz and I had a similar conversation quite a few years ago. 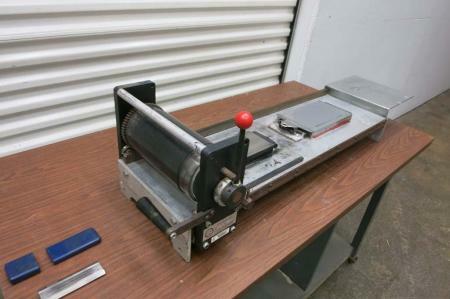 At the time, we discussed a platen press similar to a Kelsey…. and I agree that type of press would be cost prohibitive in today’s world, as would a small cylinder press with a cast iron bed. I’m not so sure I agree when talking about a small cylinder press with parts fabricated from standard stock metal sizes. I’m keeping very careful records of machine time, labor time, and materials so I’ll be able to figure out it’s real cost-to-manufacture. IF it looks like it can be built at a low enough cost, then great. If not, then like you said: I’ll at least have a new little press. Michael- Having a lathe and mill is great, isn’t it? If I do an unmachined kit, I’d consider sending you one for free as a beta test if you were interested. Dave, thanks for your kind reply. Keep us posted and maybe include a few pictures when the time comes. That is a great project! I just double checked and there are no eccentric studs. I will leave the original designers’ intentions up for debate. I have had my Nolan for 13 years, and bought it from Mr. Churchman with some visible wear on it. I just add a little extra packing to get kiss impression. Like others have mentioned, it is the cylinder style impression that gives you a little more versatility that makes tossing on or under an extra sheet of newsprint or tissue just fine. I have enjoyed your other DIY press projects, so I am excited to see what comes of this. I have always thought this is doable, but lack the machining skills and knowledge of material costs to dive into something like this myself. 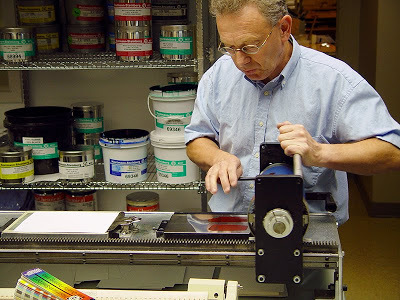 Below is a picture of a “Little Joe” ink/paint testing press. It is similar to what Geoffrey is talking about, less the drum-mounted grippers. While it may be a bit complex for this particular project, look at the end plate and axle mounts. The shaft is rigidly mounted in an eccentric on each end, and the drum turns freely on it. A handle is attached to one end of the shaft…so that by turning the handle the drum can be raised or lowered. It’s simple, would be easy to machine, and looks like it would work well.